Jamie: I'm actually very willing to share nail polish, for the most part. I frequently let my friends go through my stash and paint their nails when they come over. But there's one exception to this, and its name is Chanel Facettes D'Or Gold Fiction. I hoard this one like my life depends on it! I was salivating over this limited-edition color when it came out in 2008. But at $30 a bottle, I wasn't so willing to fork over the cash ... until it sold out, and then, of course, I wanted it more than ever. Well, color me beyond happy when I was at the Chanel counter in Bergdorf Goodman and, lo and behold, they had ONE BOTTLE LEFT. I immediately snagged it and have been ecstatic ever since. This nail polish is like liquid gold -- it flows effortlessly from the bottle onto the nail, leaving behind a gorgeous yellow gold hue that's opaque with minimal brush marks (very rare for a metallic polish). And, while some people weren't fans of the different opaque Chanel bottle, since they couldn't see how much was left, I just love it. This is one of those colors I break out time and time again for special occasions, and it always garners compliments. But, most of all, I just feel like a princess when I wear it. Note: Unfortunately, Chanel Gold Fiction was a limited edition color and is no longer available. 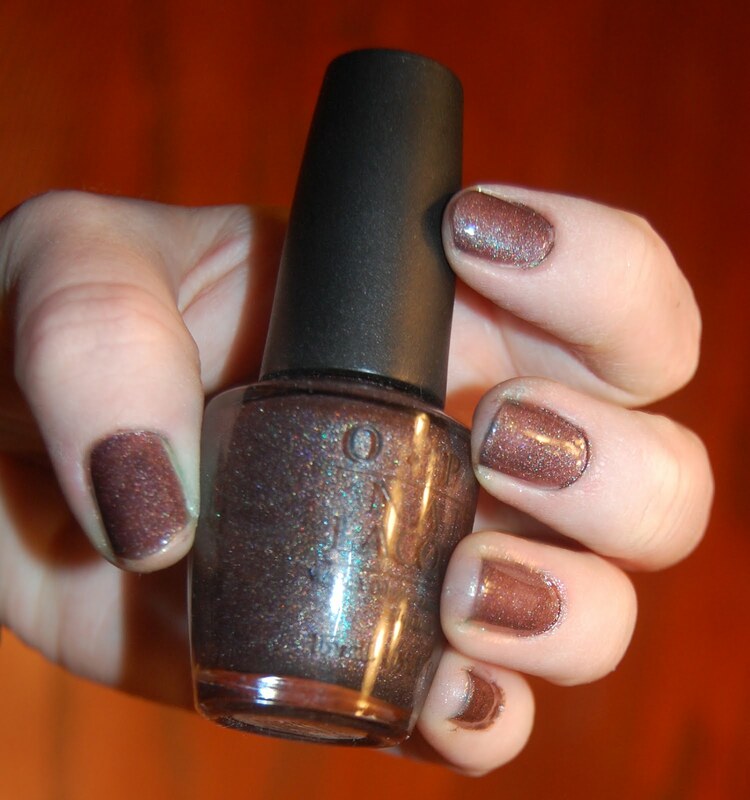 Katie: OPI My Private Jet. I don't really think I can pick a FAVORITE favorite polish, but if forced to, I think this might be it. I know there is a load of controversy surrounding it, given that it seems OPI has messed with the color and formula a few times. I can't tell you which version I have, but I can tell you that I love it. Here is how I describe this shade. It's black -- but not really. It's brown -- but not really. It's grey -- but not really. It's a crazy multi-colored holo glitter -- but not really. And that is why I love My Private Jet. It is the ultimate chameleon. When I don't know quite which polish to wear in any given situation, I always find myself coming back to My Private Jet. I used two coats for this picture. OPI My Private Jet retails for $8.50 at rickysnyc.com.